During the Battle over Coruscant which took place at the beginning of the action thriller Star Wars III - the Revenge of the Sith , Anakin Skywalker and his teacher Obi-Wan Kenobi were ordered to free Grand Chancellor Palpatine from the hands of the enemy Confederate Army. Anakin Skywalker sets out accompanied by his resourceful robot R2-D2 with the small Eta-2 Jedi Starfighter. The Eta-2 Jedi Starfighter is the most advanced fighter plane ever made. Anakin's state-of-the-art fighter has yellow markings, reminiscent of his podracer that freed him from slavery on Tattoine. 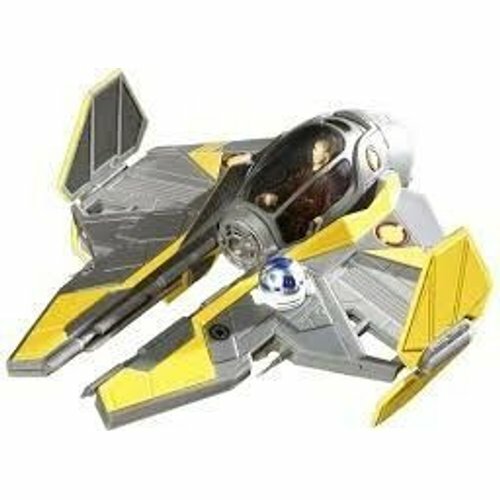 Yellow markings were also carried by the Airspeeder with which he hunted the bounty-hunter Zam Wessel through the streets of Coruscant. Anakin is reputed to be the best pilot in the galaxy and his manoeuvres take the Starfighter right to the limits of its capabilities. These dare-devil manoeuvres are extremely successful, but not always...........Fully Painted Snap Model Kit! Safety Information: Warning ! Not suitable for children under 36 month. Small parts. Choking hazard ! For kids and beginners of scale modeling! Their snap-fit feature makes assembly simple and fast.